As a private Christian, Parent Co-op Preschool, Hollister Presbyterian Preschool, serves approximately 80 children, of all faiths, from 3 years old through entering kindergarten. For over 50 years, the preschool has been serving the needs of children in the large county of San Benito. They are, and have always been, the only parent participation preschool in the area. The school takes pride on being family friendly-where you feel like you are walking into your own home when walking through their doors and making lasting and lifelong friendships within their program. “The same parents you volunteer within preschool are the parents you will see over the course of your child’s educational career in our community”, said Tina Gabel, Director and Pre K teacher. 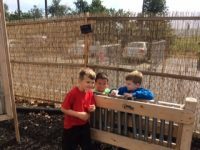 The Outdoor Classroom has been transformed from its original cyclone fencing and parking lot view to its new additions of fruit trees, planter boxes, and natural bamboo fencing. The preschool children love to build with blocks, so the teachers brought in logs and tree cookies for the children to build with. A parent donated a wooden footbridge to allow children to use their imagination to explore “new lands”. 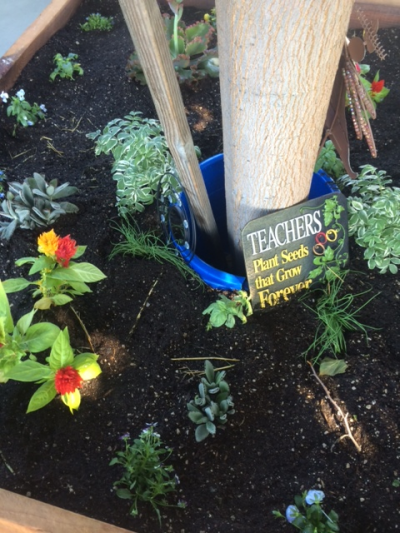 The staff is constantly researching cost-effective ways to bring natural items, real materials and loose parts into the hands of their children. These low-cost items provide students with many chances to strengthen visual-spatial, mathematical and abstract thinking and allow them a chance to experiment in new ways. The preschool was blessed to have been able to offer a Nature Explore Workshop at their site, reaching over 40 educators in the surrounding areas as well as educating their entire staff and many parents in their school. This has truly been a community affair to bring the outdoor classroom from a vision on paper to a fully functioning educational space. 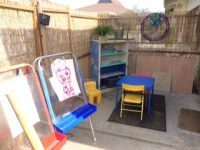 A school newsletter shares information about the Nature Explore Classroom with parents and invites them to enjoy the space with their children when working in the classroom. Educating the parents was instrumental in the development of the new outdoor classroom. “The staff has always been on board”, said Gabel, “however the plan took parent education and involvement to implement the vision of the space.” Children, staff and families stay involved in the classroom and help with general maintenance and upkeep during monthly cleaning days. Children benefit in many ways from time spent outdoors connecting with their farming community. 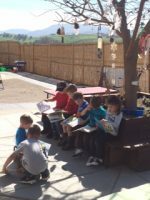 The Hollister Presbyterian Preschool Outdoor Classroom was developed with this simple and well-documented principle in mind. 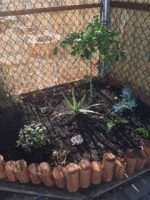 It provides opportunities that will benefit the whole child through hands-on learning, physical activity, and a means to experience the textures, beauty, and constantly changing elements of nature. Time spent outdoors also encourages the development of a child’s imagination and sense of wonder. These attributes, when instilled at an early age, contribute to the growth of children who will become lifelong learners.